G.L.S. Shackle made numerous, pioneering contributions to the study of uncertainty in economic life. This volume studies the production process, where resources must be committed to specific technological purposes long in advance of the ultimate sale of goods to the consumer. The problems of such a system rest on the durability of the instruments it uses, whose huge expense can only be recouped if they can be used for many years. Yet at the time of investment, those years of use are in the future and uncertain. The firm is the essential institutional means of confronting this uncertainty. 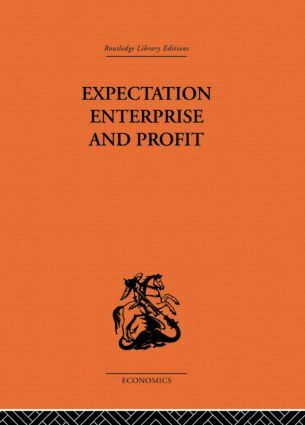 Expectation, Enterprise and Profit is concerned with the nature and mode of life of the firm as a means of policy formation in the face of uncertainty. The Nature and Matrix of Production, Investment and Expectation, Interdependent Decision-Making and Profit and Equilibrium.